In this post I share information about On-Premises SharePoint, highlights of SharePoint 2016 and see how Outlook attachments (bye-bye) are changing as we know them. Firstly I’d like to congratulate the SP24 Conference (#SP24Conf) organisers for delivering an awesome conference this week. The format was new and a challenge for those involved I’m sure. It worked very well aside from the twenty-first century hiccup or two. I look forward to the next one when the crew have all recovered and caught up on their sleep. Maybe I might be able to get a speaker slot next time where we might hear more about SharePoint 2016! I managed to stay up for three sessions before calling it a night (a late one at that – 2am UK time. I was delivering an Azure briefing at the Microsoft Offices in London the next morning. But I did manage to attend five other sessions towards the end of the day. Hopefully in few weeks we will have access to all the sessions when I’ll try to watch as many sessions as I can when the time arises. SharePoint 24 Conference – Keynote delivers important industry news and SharePoint 2016 highlights. I’d like to share some highlights I learned during the SP24 Keynote that Bill Baer’s delivered. It’s important news for all those involved in the industry to hear at this time. More importantly it demonstrates again that Microsoft are continuing to share more and more with us long before they would have done before. With Microsoft investing so much in their Cloud products whether that’s Office 365 or Microsoft Azure, many have thought that time had been called for the On-Premises version of SharePoint. Well that time is not in sight – not yet anyway! So the next version of SharePoint that we’re shipping in later 2015 will in fact not be the last version of SharePoint server that we ever ship. Sure we’ll see features and changes to these Cloud products more often specially Office 365, long before we see them On-Premises. We might not see some features at all but Bill said, “Microsoft will continue to develop in On-Premises for as long as there is demand for it”. SharePoint 2016 is not going to be the last. We are going to continue to ship SharePoint server on-premises as long as there is a demand for SharePoint server on-premises! Not only that but SharePoint 2016 will ship towards the end of 2015. In late 2015 we are going to launch another version of SharePoint server to our on-premises audience. The close integration with Yammer was clear once again and more Office Graph functionality seemed to be visible since the demonstration during the SharePoint Conference 2014 (#SPC14). We also learned about Remote Index. This will make it possible push On-Premises Search Indexes to Office 365 to provide a single search experience and result set. A unified search index in Office 365 along with Office Graph will create an awesome experience for end-users. Outlook is the first program that many of us launch on a typical working day yet we have many other sources of information. 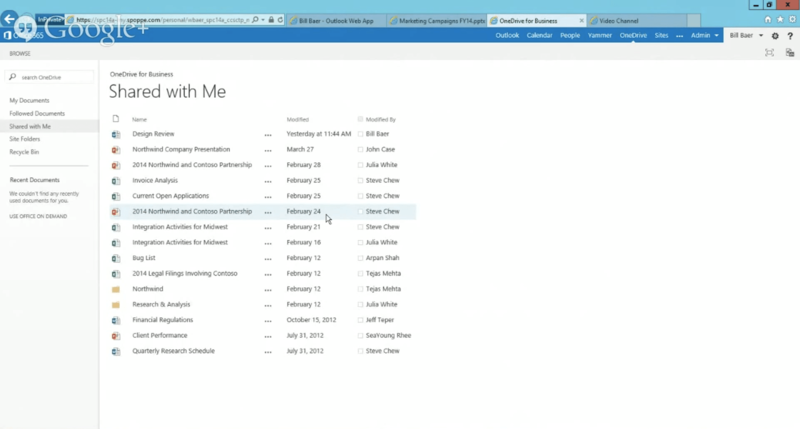 Expect to see changes to Outlook that will help us access this information and deliver more than just email to us. 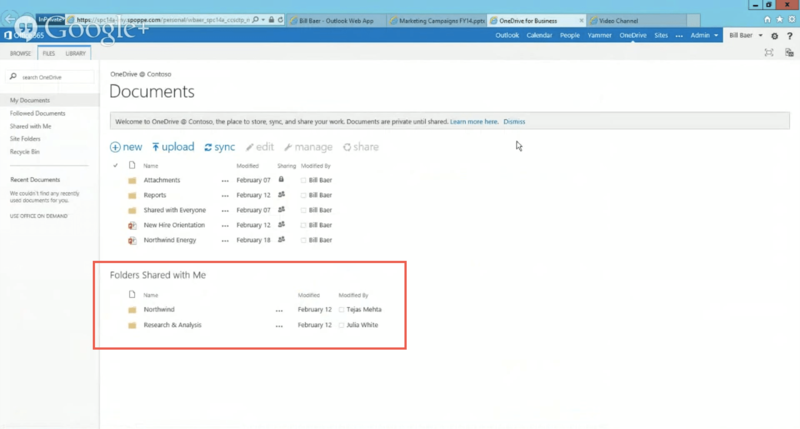 A further change to Outlook and SharePoint 2016 that we’ll see in the next version is the removal of email attachments as we know them with the help of OneDrive for Business. Users will continue attach files to their emails but they’ll be saved to their OneDrive for Business Document Library and shared with all to, cc and bcc addresses via a URL in the email. This is a really exciting change and I look forward to discovering more about soon. The net result is users will have continuous access to the latest files and canuse features such as Co-Authoring. It’s official you can now customise the Office 365 login page with your own branding – ok not quite yet but Microsoft have just released a preview feature that will soon allow us to. The dull Californian highway image that we are all accustom to can now be replaced with your own image along with your own logo and login information which is impressive in itself but these elements can also be localised for different languages. This is all achieved with a preview feature Microsoft have recently released for Windows Azure Active Directory Premium which of course underpins Office 365. Pricing for this feature is not yet available but I imagine it will be published soon. 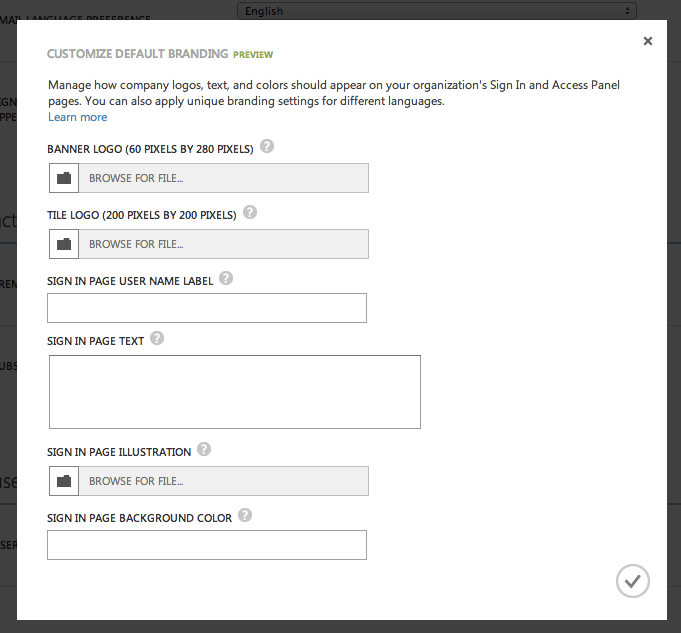 Microsoft have made the following elements of the login page customisable. The “Banner Logo” which is displayed on the sign page and access panel. 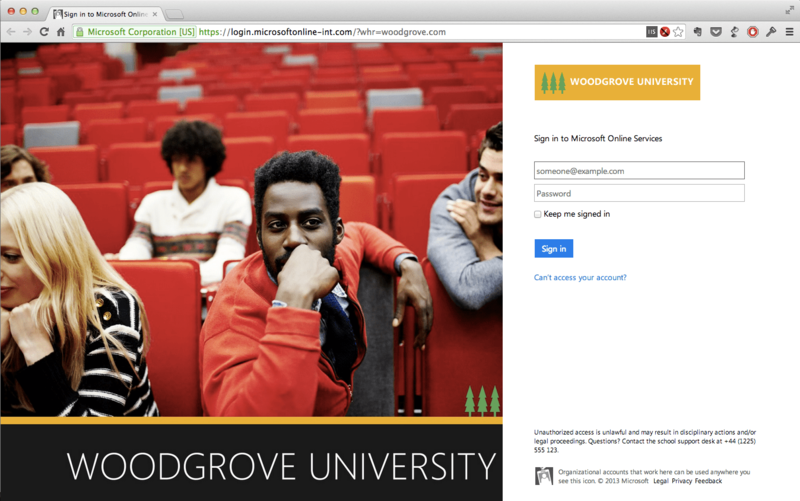 The “Sign In Page Illustration” displayed on the sign in page to the left of the login form. The “Sign In Page background color” visible when there is no sign in page illustration present or for low bandwidth connections. The “Sign In Page Text” that appears below the login form and can be used to give more information to users such as where to get support. The “Tile Logo” which is not used but might be used to replace the “organisational account” pictogram. A “User ID Label” which again is not used but could be set to “Company email” or “User ID” . Follow the recommendations Microsoft have included in this Add company branding to your Sign In and Access Panel pages TechNet article. Browse to the Active Directory page and select your Office 365 directory. Click on the “Enable Active Directory Premium” link on the summary page. Then from the summary page click on the “Customise your organisation’s Sign In and Access Panel pages” link where you will be able to upload your logo and other assets. As this is a preview feature Microsoft have decided for the first few weeks of the preview that users must opt in on each device to experience the customised sign in page. To opt in you must visit https://login.microsoftonline.com/optin.srf. Microsoft have also provided to demo fictitious sign in pages that you can get access to experience a customised login page. Further information can be found on the Add company branding to your Sign In and Access Panel pages TechNet article. If you’re working with Windows Azure and want to use PowerShell to perform management tasks you will first need to install and configure Windows Azure PowerShell as per this article “How to install and configure Windows Azure PowerShell“. Check to see that you can are connected to your Windows Azure subscription by entering Get-AzureSubscription which should return information about your subscription. 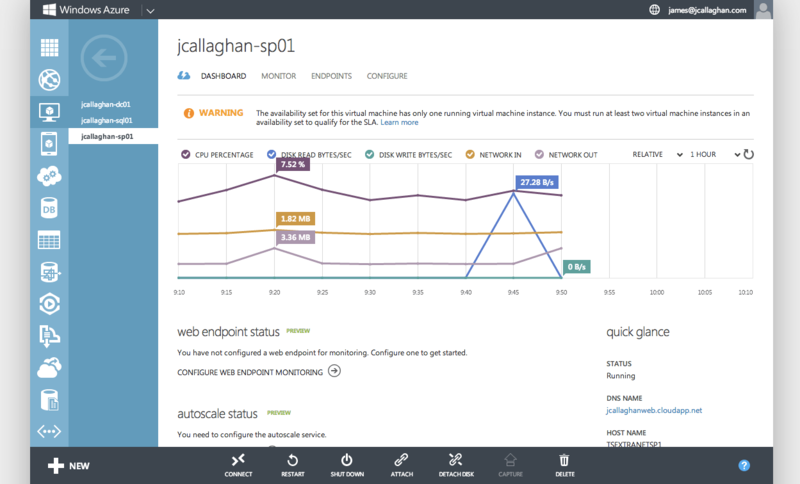 That’s it – you should now be able to manage Windows Azure using PowerShell. Update: while the VIP address is guaranteed for the lifetime of the deployment – a customer recently lost their VIP address which resulted in their custom domain name become unresolvable. Whilst this was acceptable as we were still in a phase of testing it did cause me some concern. Why had the VIP address changed without our knowledge – we had not made any configuration changes to causes this.I did some further research and found an article (Using custom domain names with Windows Azure Cloud Service) in the Documentation section on the Windows Azure website were it advised you should use CNAME records and point these to your *.cloudapp.net domain name. I asked the customer to do this and we have been able to use the system since. This post describes how I configured one of my Windows Azure hosted Virtual Machines with my domain name registrars DNS – this meant that I could make SharePoint 2013 available using my domain name. On the virtual machine instances page in the Windows Azure Management Portal (https://manage.windowsazure.com) browse to the virtual machine you want to configure with your external DNS. 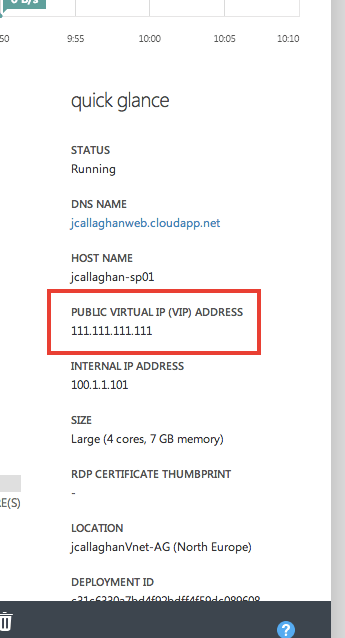 On the right in the “Quick Glance” section you will see that a “Public Virtual IP (VIP) Address” is listed (this is shown in the image below but for security purposes I have changed my VIP to 111.111.111.111). The VIP address is the IP address I need to direct my external DNS to. This VIP address is guaranteed to remain for the deployment of the cloud service – therefore if the deployment is removed the VIP address will no longer be available. Corey Sanders has written a great article on the Windows Azure MSDN blog (http://blogs.msdn.com/b/windowsazure/archive/2011/07/06/windows-azure-deployments-and-the-virtual-ip-address.aspx) where he confirms that the VIP is guaranteed for the lifetime of deployment and provides a great alternative if the virtual machine deployment has to be removed. I also decided to add a shorter TTL to my A record just in case the VIP address does ever change for whatever reason and I need to propagate a change quickly. I’m not sure if this is advisable or not and am seeking confirmation on this. A quick test you can do before making any changes to your DNS is to browse directly to your VIP address (http://111.111.111.111). 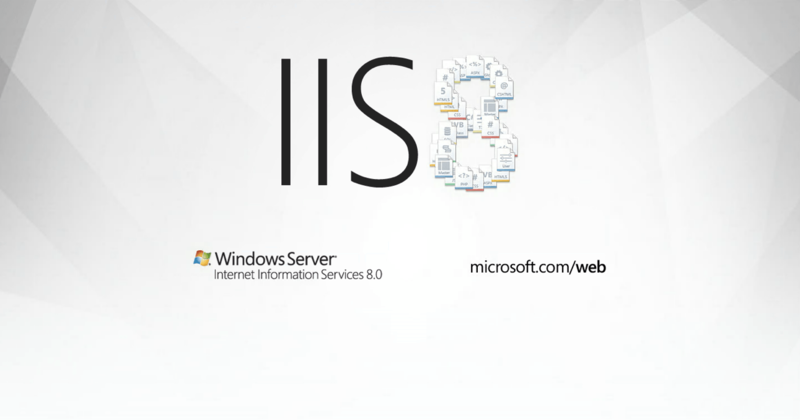 This in my case took me to the default IIS site however this will depend on your configuration. After I confirmed that the VIP address was accessible I then proceeded to make changes to my external DNS through my domain registrars control panel – in this example I wanted to point a host record (or an A record) to my virtual machine.